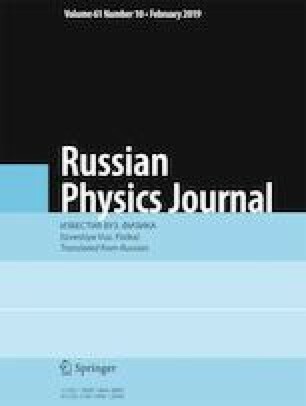 This work is dedicated to a study of the influence of the duration of an electrical discharge on the size of the melting zone formed at a cathode of VT20 titanium alloy. It is found that the melting zone possesses radial symmetry and is surrounded by a ring-shaped zone, whose surface is exposed to electrical erosion. The dependence of the radii of the melting region and the erosion zone, and of the volume of melted metal on the duration of the discharge pulse is determined in the interval from 0.05 ms to 1 ms. A mathematical model is proposed, allowing us to calculate the temperature distribution in a metal plate at different times during the discharge. The parameters of a nonstationary surface heat source arising in the region of the electrical discharge are found from the condition of coincidence of the position of the boundary of the solid–melt phase transition observed in experiments and determined by solving the heat transfer equation. Translated from Izvestiya Vysshikh Uchebnykh Zavedenii, Fizika, No. 12, pp. 83–89, December, 2018.